Of course any recipe that may be showy or special can often be accompanied by a good dose of intimidation. 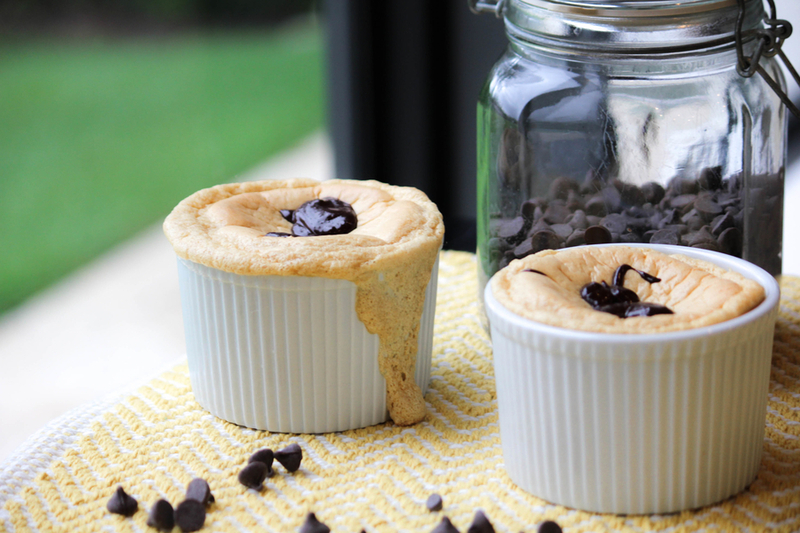 Whether you are an experienced cook or not, there is no dish that’s more fear-inducing than the souffle. And yet, if you follow just four simple souffle steps you can eliminate the fear-factor and almost be guaranteed of pillowy, fluffy success. I think the most important step in making a souffle is to pay close attention to the egg whites. You want them very, very stiff. Take a look at the photo to the left. See how the egg whites look like whipped cream? That’s exactly what you want. 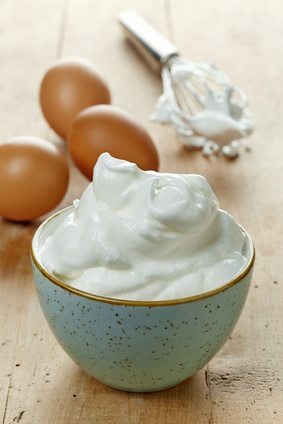 Do not even think of moving on to step 4 of the recipe until your egg whites look like fluffy whipped cream. And when you finally do move on to step 4 you just want to fold your fluffy egg whites extra gingerly into the peanut butter mixture. Once you get past the egg white ordeal, the rest of the recipe really is easy peasy. But is it clean? Yes! 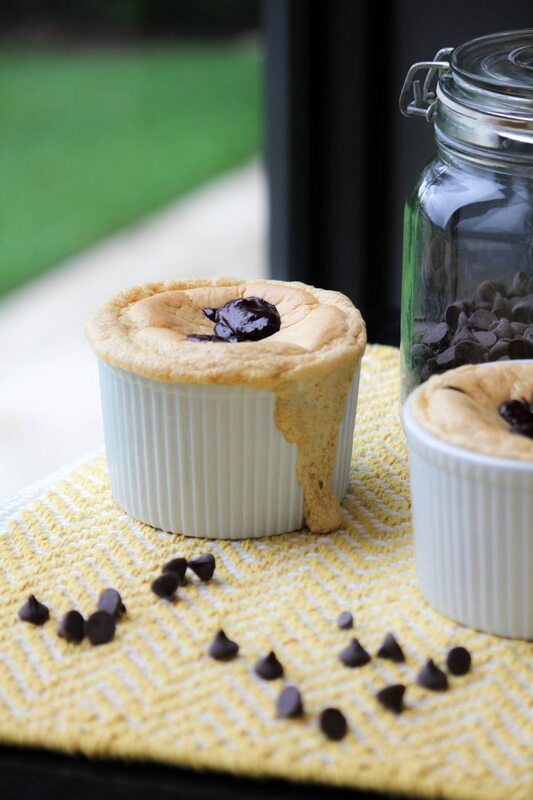 Although a Chocolate and Peanut Butter Dessert Souffle is probably not the first thing that pops into mind when you think of eating clean, this particular recipe really is suprisingly healthy. 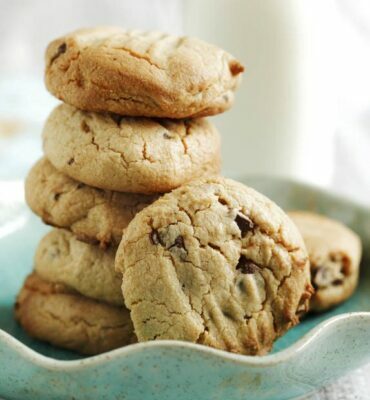 It is dairy-free, sweetened with unrefined coconut sugar and has no refined flour or oil. The only thing is, it does fall pretty quick! I hadn’t made souffle in ages and I just was not prepared for it to fall as quickly as it did. When I pulled the souffles from the oven I didn’t have my photo spot camera-ready so there was a good 15-minute delay between removing the souffle from the oven and snapping the photos. The souffle was definitely much fluffier right from the oven! So, if you are planning to prepare this recipe for guests, just be prepared to serve the souffles immediately after removing them from the oven. Preheat oven to 350 degrees. Lightly oil the bottom and sides of six 1-cup ramekins and dust with almond flour. In a small saucepan over very low heat, melt the peanut butter with the coconut oil, stirring occasionally, until smooth. Stir in 4 tablespoons of the coconut “cream.” Set peanut butter mixture aside to cool. Whisk the egg yolks into the cooled peanut butter mixture until smooth. In a very large bowl, add the egg whites and cream of tartar; use a handheld mixer set at medium speed to beat the egg whites until stiff peaks form. Keeping the mixer on, slowly add in the coconut sugar a tablespoon at a time. Using a large rubber spatula, gently stir in one-fourth of the beaten egg whites into the peanut butter mixture to lighten it. Then fold the peanut butter mixture into the beaten egg whites, one-fourth a time, until well blended. Divide the mixture among the prepared ramekins, filling them about three-fourths full. Set the ramekins on a large baking sheet and transfer to the preheated oven. Bake until souffles rise and are ever so slightly browned on top, about 15 to 17 minutes. 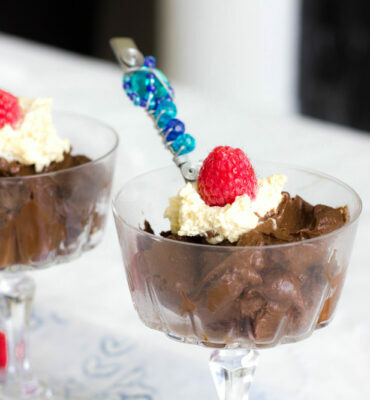 While the souffles are baking, add the chocolate chips, cacao powder, vanilla extract and remaining 3 tablespoons of coconut “cream” to a small saucepan and heat over very low heat, stirring, until mixture is smooth. Remove the souffles from the oven and carefully poke a hole in the center of each one. 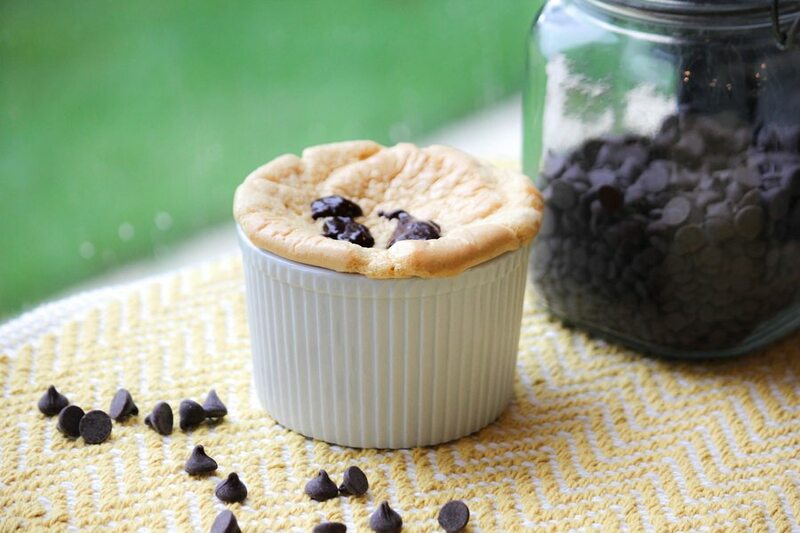 Drizzle the chocolate sauce into the middle of each souffle and serve at once. Coconut “Cream” is the thick, rich and non-watery part of canned coconut milk. To get the “cream” you need to refrigerate your coconut milk for 5 or 6 hours or pop it in the freezer for at least an hour. Once the coconut milk is cold, carefully remove the top with a can opener and use a spoon to scoop out the hardened coconut “cream” off the top. Also, for what it is worth, I always seem to have the easiest time getting the cream from Thai Kitchen brand. Looking for More Organic Recipes? If you liked the Peanut Butter Dessert Souffle, be sure to check out our Clean Cuisine Superfood Cookbook (only $2.99 as a digital download). The book includes 40 superfood soups, salad dressings, smoothies, sauces, dips, desserts and more! Hi Karen, I’m not sure if you got my initial response to this because we were in the process of switching servers from BlueHost to Flywheel and I think my newer comments did not get switched for some reason. But I made a BIG mistake in the recipe because it should have been 4 egg yolks and 8 egg whites. I have fixed the recipe now though. Thank you so much for catching this!! I’m so sorry for any confusion.